Vitally's Mixpanel integration allows you to sync your Mixpanel data into your Vitally account. When fully configured, you'll be able to run reports on your Mixpanel data from within Vitally and track your product's features and metrics with tools like Elements and Success Metrics. Navigate to the Mixpanel integration page within your Vitally account. This can be found in your Account Settings in Vitally by navigating to the Product Data integrations list. 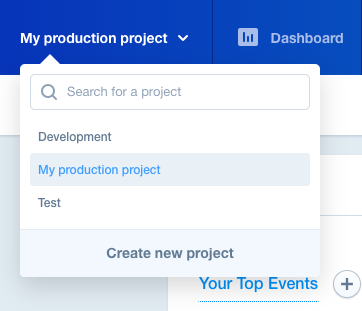 Ensure your production Mixpanel project is selected in the top left. 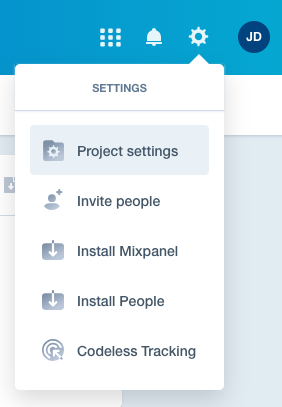 In your production Mixpanel project, select Project Settings from the options in the top right. In the displayed window, copy your project's API Secret and paste that in to Vitally. Back in Vitally, paste that secret into the input field when enabling the Mixpanel integration. That's it! If your secret appears valid, you'll be able to move to the next step.